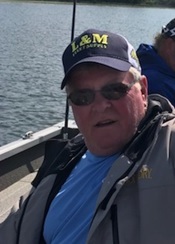 Topeka - Gary C. Swenson, 66 of Topeka, Kansas, passed away April 13, 2019 at Stormont Vail Hospital. He was born May 15, 1952, in Council Grove, the son of Adrian and Violet (Gleason) Swenson. He married Debbie Longan and they had two boys: Matt and Mitch. They later divorced and he married Beverly Miller. Gary graduated from Council Grove High School and began his career as a Plumber, after attending vocational training in Manhattan, KS. He was an acting partner in family owned businesses such as Swenson’s Plumbing & Heating and Adam’s & Swenson’s Construction. He went on to become a member of the Plumbers and Pipefitter’s Local Union #165 in Topeka, where he dedicated himself as an instructor, at the Apprenticeship Training School, in addition to being a plumber and pipefitter. Gary retired from the Local Union # 441 in 2015. Gary enjoyed fishing and hunting, and loved spending time with family and friends. He was preceded in death by his parents and his wife Beverly in 2008. Gary is survived by his sons: Matt and Sherri Swenson and Mitchell and Rene Swenson, all of Topeka; sister Jeanette Smith; grandchildren: Aidan, Avary, Cora, Caden and Kendall; nieces: Amanda Dunkle (Mike), Suzanne Smith, Melynda Hagge (Heath) and Jenna Rivera (Richard); and a host of friends. Gary will be sadly missed by all who knew him. A memorial graveside service, celebrating Gary’s life, will be held at 11:00am, Friday, April 19, 2019, at the Dwight Cemetery. There's still time to send flowers to the Memorial Graveside Service at the Dwight Cemetery at 11:00 AM on April 19, 2019.